In Santa Fe during a family vacation in 1969: my dad, me (in the pool) and my younger brother. I have been blessed with two fathers. The father of my childhood taught me to dream. The stepfather who followed showed me what it means to be a grownup. When I was a child, I thought of my dad as an adventurer. He was 10 years older than my mom and had spent part of that time traveling the world in the Navy at the end of World War II. Whether struck by wanderlust or fleeing demons, he couldn’t seem to stay put for more than a short time. He changed careers a half dozen times in the 20 years I lived at home. My family lived in nine different cities in five different states before I graduated from college. My dad had a natural, if frenetic, charisma and was prone to teasing and jokes that I mistook for social skills and self-confidence. Because I knew no different, I thought of our frequent moves as romantic crusades in quest of happiness and creative fulfillment. My dad left sales to study journalism. He talked of writing a book. But always there were things in the way. I grew up thinking it was my mother, my brothers and me. Much of my father’s earlier life was cloaked in mystery. He never talked about the house that burned down when he was small or the late-night trips when his mother bundled two sons into the back seat of the car and went out searching for a drunk husband. Later in his life, he watched a lifelong friend succumb to ALS, or Lou Gehrig’s disease. He never talked about that, either. But my dad did eventually realize his dream. After my parents divorced, he moved into a boarding home near a beach in Florida and managed to complete a manuscript. He always told me it would explain everything he couldn’t tell me. When he died, I couldn’t read it. I didn’t want to be disappointed yet again. By then, my mother had remarried. With so many unresolved issues about my relationship with my birth father, I wasn’t in any hurry to bond with this one. I faced their marriage by forcing myself to realize that it was my mother’s life and happiness that mattered, after all. Not mine. 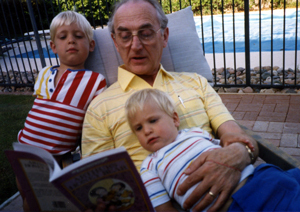 "Grandpa Paul" reads a book to my sons Andy (left) and David in April 1989. But in tiny ways, over several years, this wise man won me over. I saw how sincerely he loved my mother, how much better he made her life. I saw how joyfully he welcomed my sons into his life and became the only grandfather they ever knew. I saw how patiently he waited for me to come around, never forcing the relationship, never indicating by anything he said or did that he was impatient or hurt. He let me build my castle walls and defend them with polite but determined vigor. And quietly, before I even fully realized it, he became part of the foundation beneath me. His opinions mattered to me. His example inspired me. His perspectives on life, love, spirituality and self-fulfillment seeped into my consciousness and I found myself wanting to emulate him. He’d had moments of terrible sadness in his life, too, but he’d risen above them with maturity, honesty, communication and grace. And so, on this Father’s Day I am thankful for two fathers. The one who planted seeds and the one who taught me how to cultivate them. I’ll happily acknowledge my six degrees of separation on this one but I’m going to brag anyway. Raising Arizona Kids has published the works of a Pulitzer Prize-winning journalist. Paul Giblin and sons in 2006. Our June 2006 Father’s Day issue included several Q&A essays written by local dads. One of the essays was written by then Tribune News reporter Paul Giblin. Ironically, as the New York Times reports in today’s business section, Giblin was one of many reporters laid off when the Tribune, owned by Freedom Communications, downsized in January. Giblin and a few colleagues now run The Arizona Guardian, a news website focusing on Arizona government and politics. For our story, Giblin described the most difficult aspect of being a dad. He said it was “trying to set an example all the time” for his sons Casey and Tim. Reaching the pinnacle of one’s profession is setting a pretty good example of what can happen when you work hard, care a lot and give it everything you’ve got. So I’m sure the old man has made his sons proud. But I’m guessing it’s not just because he won a prestigious award. They saw him absorb a tough blow, pick himself up and — taking no time for self-pity — move on. I can’t think of a better example than that.